The community of Homestead, located in Edmond, Oklahoma, and its home owners’ association, known as Homestead Property Owners’ Association, Inc., welcomes you to our neighborhood. 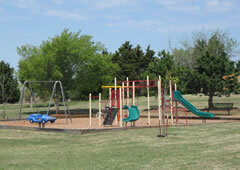 Homestead features 273 family homes located in northwest Edmond. There are two ponds to fish in, a pool, and two playgrounds. With convenient access to shopping and several universities, Homestead is the perfect place if you are just starting out or looking for a comfortable place to retire.